Taylor Hearn had a sensational start to Friday night’s game, recording strikeouts on seven of the first eight outs, and it was easy to see why he has a chance to be a future major league star. He’s a lefty, throws 97 mph and just looks imposing at 6-foot-5 and 227 pounds. 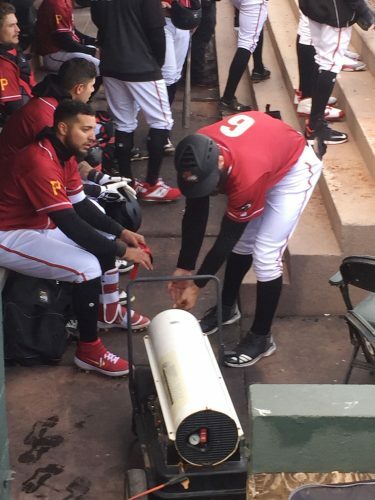 The flip side, though, is that Hearn struggled as his night went on, giving up four runs in the Curve’s 6-1 loss to Erie at Peoples Natural Gas Field, snapping their five-game winning streak. It was a seven-inning game as the first of a doubleheader, and the second game was suspended because of rain with Altoona leading 3-1 in the bottom of the third inning. Hearn now has an earned-run average of 5.81 and an 0-3 record through five starts in his first season at Double-A. Those overall numbers are hard to believe if you just watch him pitch and see the electric stuff he is capable of throwing. Still, the numbers are the numbers, and Hearn has had a rough go of it lately, allowing 16 runs in 151/3 innings over his past three starts. “The one thing I’ve learned this month is that Double-A is definitely a challenge, but it’s not a challenge I can’t conquer,” Hearn said. “Yeah, over 5.00 ERA and stuff, but I think productivity and stuff I’ve been doing pretty well. This year’s Curve team is loaded with promising prospects, and Hearn has a chance to be as good as any of them. He came to the Pirates along with Felipe Vazquez in the 2016 trade with the Nationals for Mark Melancon. But just as Friday’s game showed, no matter how sensational Hearn can look at times, finding consistency is the key for the 23-year-old. Which is, of course, exactly what the minor leagues are for. Hearn struck out Erie’s first two batters of the game. He gave up a leadoff walk and double in the second, then struck out the next three hitters. He ran his streak to five consecutive strikeouts by fanning the first two guys in the third, making it seven of the first eight outs being strikeouts. In the fourth, however, Hearn walked Dominic Ficociello to start the inning and allowed a two-run homer to Gabriel Quintana. He then gave up a bunt single and another single, but was able to get a double play and escape the inning down just 2-0. Hearn ran into immediate trouble in the fifth when he failed to cleanly field a bunt, which went for a single, and Jake Robson followed with an RBI double. Ficociello later singled home a run to make it 4-1. As dominant as he had looked earlier, Hearn wound up allowing four runs on seven hits with nine strikeouts and two walks. For Hearn’s part, he took positives out of the game because of his great start, but also learned a lot because of how things went in the later innings. “Definitely just learning that guys are going to be swinging off me early as the game gets later on and continue throwing my offspeed for strikes,” he said. Erie starter Tyler Alexander picked up the win, giving up just one run on seven hits over 5 1/3 innings. Kurt Spoomer got the final five outs for his first save. Key player: DH Gabriel Quintana went 2-for-3 with a homer and three RBIs for Erie. Key play: Quintana’s two-run homer in the fourth put Erie on top to stay. Key stat: The Curve had their five-game winning streak snapped. Top 4th: Ficociello walked, scored on Quintana two-run homer (0-2). Bottom 4th: Mathisen solo homer (1-2). Top 5th: Montgomery singled, scored on Robson double (1-3); Ficociello single scored Dobson (1-4). Top 7th: Alcantara reached on fielder’s choice, scored on Quintana single (1-5); Ficociello walked, scored on Lester single (1-6). 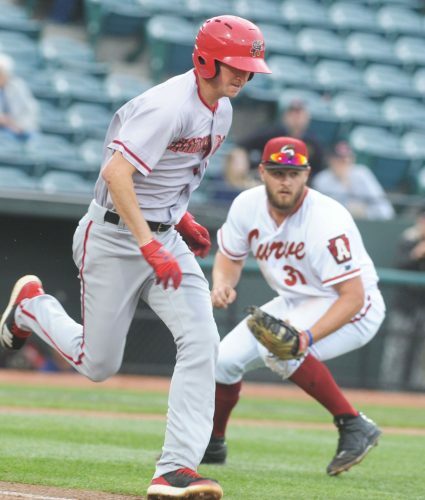 LEADING OFF: The Curve will play a doubleheader today starting at 3 p.m., with gates opening at 2 p.m. The earlier gate time is important for those who want to get their Starling Marte bobblehead, which will go to the first 1,000 fans. SAFE AT FIRST: The first game today will be the resumption of Friday’s suspended game, with the Curve leading 3-1 with a runner on first and two outs in the bottom of the third inning. The game will last seven innings, because it was scheduled for seven as part of a DH on Friday, then the second game also will be a seven-inning contest. Friday was “Star Wars night” on May the 4th, so the team was wearing Han Solo shirt replica jerseys in the second game. STEALING SECOND: RHP Pedro Vasquez was added to the Curve roster Friday and started the second game. He was scheduled to open the season with the club but had to stay in extended spring training because of an illness. ROUNDING THIRD: LHP Sean Keselica was placed on the roster of short-season West Virginia to open up a spot for Vasquez.